If you have no experience with fencing and animals, here is a bit of free advice should you ever decide you want to enclose some sort of animal: Give 100% of the fencing your best effort. If 99% of it is completely up to spec in every way, and 1% is questionable, you will spend all of your time worrying about that 1% if you’re not actively watching your animals every moment. Rightly so – the animals have all of their time to find that weak point and exploit it. They’re enclosed, they probably don’t want to be enclosed all the time, and thus, they may well try to escape. Right now, I have 99% of the chicken yard appropriately fenced. There is a gap in the roof netting about 10′ x 10′ that will get fixed ASAP, probably tomorrow, so I don’t have any niggling worries. The gap is directly under the heart of the tree branches, and will require a ladder to get sorted. As it stands, a hawk or an owl or whatever-airborne-predator-have-you could relatively easily hop from branch to branch, find the gap, and dine on my girls. If you’ve ever seen a raptor consume its live prey, you understand why I’d like to avoid this. The power didn’t get run, either, so they’re back in the basement for the night. I’ll probably let them out when I go to work in the morning and ask Mike to check on them from time to time… or maybe not, I don’t know. It’s that stinking one percent. They were fine out there for hours today, but there was almost always a human about to ward off casual predatory interest. But I know how determined predators are. On two occasions, I found myself face to face with some of our more unfriendly wolves out of their enclosures at Wolf Haven. That was interesting. 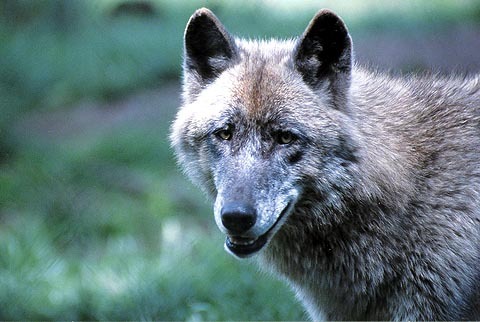 On other occasions, other (friendlier) wolves demonstrated exactly how determined, how powerful and how resourceful they could be, requiring hours of luring, chasing and outright shenanigans to get them back into their own fencing. Fortunately, such occasions were extremely rare, and a full escape was prevented by the perimeter fencing around the entire sanctuary. My time taking care of the wolves was hugely instructive in so many ways. I really miss that place, and the animals, and the people. I miss having the energy it took to care for the wolves in our care. Heck, I miss having energy, period. Each choice to go do something outside, involving work, is a conscious inner struggle. The work in the garden and with the chickens has taken its toll elsewhere – housework, laundry, cooking. Things I used to do every day, but haven’t been able to stir myself to bother with much. The calendar system I had in place? Ha. I only loosely adhere to it, and by “loosely,” I mean, “Oh right, I was supposed to clean the bathrooms yesterday,” and then I swish the toilet brush around half-heartedly and call it good. Things I want to write about poke into my consciousness, and I’ll compose a sentence or twelve in my head… and then when the moment comes to sit down and write, I don’t. I look at emails and can’t find the energy to answer them, despite wanting to. How absurd is that?! Fingers on a keyboard and minimal brain power, and yet I cannot summon the ability. The asparagus, herbs and plum tree still need planting. I hope the weather is pleasant tomorrow when I get out of work.